Attorney General Jeff Sessions, then the star of President Trump’s early Cabinet, was assembling his staff and picked Sarah Isgur Flores as his top spokeswoman. There was just one problem: She had criticized Trump, repeatedly, during the 2016 Republican primaries. Flores’s prospects for a Justice Department job stalled, and Trump’s advisers knew there was only one way Sessions would be able to hire her: If she kowtowed to Trump. So she paid her respects to the president in the Oval Office — a cordial visit during which she told the president she was on board with his agenda and would be honored to serve him, according to several people with knowledge of the meeting. The early 2017 episode, which has not previously been reported, underscores the extent to which Trump demands loyalty in vetting administration officials — even well-qualified Republicans like Flores seeking jobs on the personal staffs of Cabinet secretaries, who historically have had considerable leeway to do their own hiring. Credentialed candidates have had to prove loyalty to the president, with many still being blocked for previous anti-Trump statements. Hundreds of national security officials, for example, were nixed from consideration because they spoke out against Trump during the campaign. But for longtime Trump loyalists, their fidelity to the president is often sufficient, obscuring what in a more traditional administration would be red flags. The failed nomination of Ronny L. Jackson, the president’s physician, to lead the Department of Veterans Affairs was the latest example of the sometimes haphazard way Trump unilaterally elevates people with whom he has a personal rapport. The result, as was the case with Jackson, is that many candidates who may not be considered qualified for their positions were thrust forward by the president before a thorough vetting of their professional and personal backgrounds could be completed — and without the necessary political support to help them weather challenges. “They need to probably vet before they start throwing names out,” said Sen. Joni Ernst (R-Iowa). Walter Shaub, a former director of the U.S. Office of Government Ethics who resigned last summer in protest of Trump’s conduct, said the president’s “ethics are based on loyalty.” Shaub said he repeatedly told administration officials that they should slow down and vet candidates. Even Vice President Pence is not immune. At least two of his top candidates for his national security adviser faltered after being deemed unfavorable toward Trump. Jerry Hendrix, a retired Navy captain, was seriously considered but was dinged in part because of an anti-Trump tweet, according to two people familiar with the matter. Hendrix declined to comment. Pence later announced that he was bringing on Jon Lerner, the deputy to U.S. Ambassador to the United Nations Nikki Haley, in an unusual arrangement in which he would continue to work for Haley part time. But Lerner backed out of the White House job after the president became upset after learning that he had previously worked for the Club for Growth, an anti-tax group that attacked Trump during the 2016 primaries, as well as for the presidential campaign of Sen. Marco Rubio (R-Fla.). Trump aides say the White House follows vetting procedures similar to those of the George W. Bush administration. The Office of Presidential Personnel, which is run by Johnny DeStefano, employs Katja Bullock, 75, who has worked in the same office during the past three Republican administrations. But the office has come under scrutiny since a Washington Post report revealed that it is as much a social hub as a rigorous operation, with young former campaign workers hosting happy hours, playing drinking games and smoking electronic cigarettes there. According to aides, the process generally begins with in-person candidate interviews, with vetting personnel assessing suitability by asking questions such as whether a candidate has been party to any lawsuits or joined clubs that restrict membership on the basis of ethnicity, gender or other categories. Candidates fill out questionnaires similar to the SF-86 form required by Senate committees for nominees requiring confirmation. The White House vetters also search public records to investigate candidates. In addition, the vetters consult department and agency officials to determine whether candidates are qualified. White House lawyers review possible conflicts of interest or other ethical and financial questions. Once the president signs off on a nomination or appointment, the FBI begins a background investigation that is used to determine a security clearance, and an IRS tax check and credit check are also conducted. But lawyers involved in the process say Trump, or the White House, often announces picks before they are fully vetted — and they describe an irregular process that sometimes is not followed if a candidate has high-level approval. On the most senior nominees, anything goes. During the transition, a number of Cabinet officials were announced with little more than a public-records search, according to current and former administration officials. “He would announce, and then we’d say, ‘You need to fill out some forms,’ ” one former official recalled. 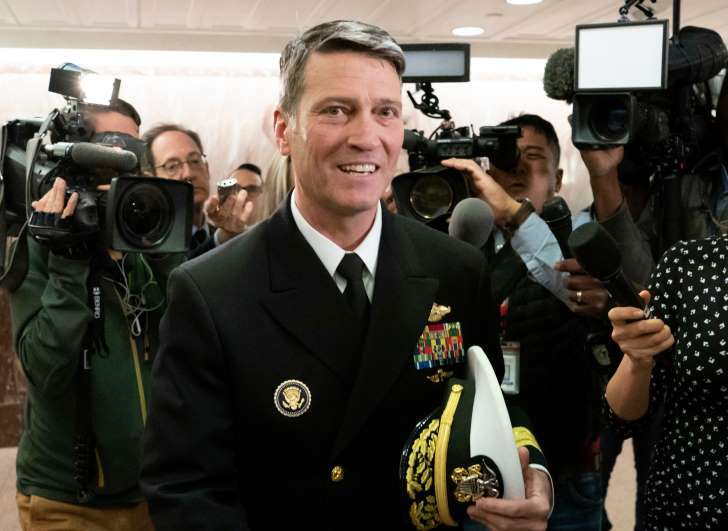 In Jackson’s case, the president stunned some of his most senior aides when he told them in the Oval Office on a Monday in March that he might select his personal doctor to lead Veterans Affairs. At the time, the department’s embattled secretary, David Shulkin, was still on the job, and officials said that neither Trump nor his team had conducted an even cursory interview with Jackson. Aides urged the president to delay the announcement, but two days later, he shared his new VA pick on Twitter. The White House defended the nomination by arguing that Jackson already had been thoroughly vetted because of the sensitivity of his job as presidential physician. But a White House official acknowledged that Jackson’s FBI background investigation was not completed until after Trump had already revealed on Twitter that Jackson was his pick. The White House also neglected to consult or even notify key members of Congress before the announcement. Including lawmakers in the deliberations might have helped ease Jackson’s path, according to White House officials and senators. Since the early days of the presidential transition, however, the Trump team has been especially thorough in vetting job applicants for their loyalty to the president and his policies, with their social-media profiles and writings scoured for anti-Trump posts. Even tepid comments in opposition could torpedo nominees, current and former officials said. Trump himself would sometimes ask if candidates were “Never Trump” or if they supported him during the general election, officials said. Having posted on social media with the hashtag “#NeverTrump” or having signed a public letter in opposition to his candidacy made the nomination a non-starter. Aides described a process of simply using Google searches to vet candidates during the transition, as well as soliciting recommendations from other political appointees, before the more rigorous White House vetting process was underway. Early in the administration, when more than a dozen senior aides regularly breezed in and out of the Oval Office, some would deposit negative articles on the president’s Resolute desk about their internal rivals in an attempt to block them, people familiar with the matter said. White House officials explained that the president can appoint only a tiny fraction of the federal workforce, and said that it is reasonable therefore that he be able to demand fidelity from those appointees. Problems often arose when the president chose candidates largely on a gut impulse. For example, Trump hired Rex Tillerson as secretary of state after a meeting with him, remarking to advisers that he admired his swagger and business acumen. He did not, however, delve into their foreign policy differences, which became a source of tension and, ultimately, a reason for Tillerson’s firing. More recently, Trump announced the hiring of Victoria Toensing and Joseph DiGenova as his personal lawyers in the Russia probe after watching them on cable news defending him. But the arrangement collapsed days later after aides found conflicts of interests with other clients. And White House officials said they did not read a vetting file on Rob Porter, who was later ousted as staff secretary amid allegations of domestic abuse by his two ex-wives, even though the FBI had interviewed the women, collected photographic evidence of the abuse and shared its findings with the White House. Others seemed to face higher scrutiny for lesser alleged misdeeds. Ann Marie Hauser, a senior staffer in the office of Sen. John Thune (R-S.D. ), was slated to become a top appointee at the State Department. But in searching her public profile, officials found she had retweeted a 2016 post from the South Dakota Republican calling for Trump to drop out of the race after the “Access Hollywood” tape surfaced, according to people familiar with the matter. Hauser, who declined to comment, saw her candidacy scuttled, these people said. She never made it to Foggy Bottom. Seung Min Kim and John Hudson contributed to this report.